Situated right in the heart of the city , next to Queen Square – very close to the waterfront – it is the perfect new venue for dining before or after the theatre, for business meals and special occasions such as a birthday group night out or a Corporate do. 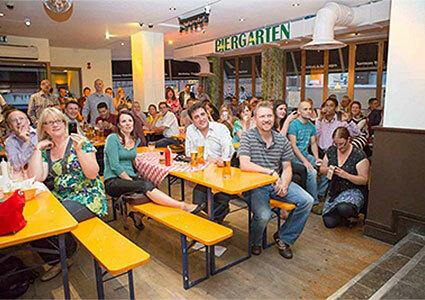 Bavarian Beerhouse Bristol has got a large seating area downstairs (150 covers) and a private dining area upstairs for groups of 50 guests. A full beer, gastro and entertainment concept, the Bavarian Beerhouse serves traditional Bavarian dishes such as freshly baked pretzels, sausages of all kinds, schnitzels, meatballs and Bavarian cheeses. All the meat, pretzels and bread are imported from Germany by the Bavarian Beerhouse’s own freezer truck, once a week. Guests can also go along just for drinks, and are able to enjoy popular German and Bavarian beers such as Krombacher Pils Bier and Erdinger Wheat Bier, served in traditional glasses like Steins. The Bavarian Beerhouse is the UK’s largest seller of Krombacher and Erdinger and the world’s second largest seller of Krombacher. The new Bristol restaurant will seat 200 downstairs and a further 50 (soon to be extended to 80) upstairs, with separate bars on both floors. The venue is of a good size, which is necessary to create the authentic ‘beer hall’ atmosphere and character, so crucial to the German experience, with long wooden tables and benches that make it easy to meet up with friends and colleagues. The décor features three themed areas in the style of a ‘Biergarten’ (beer garden), Oktoberfest beer tent and Alpine chalet, with relaxed table service provided by staff in the traditional Bavarian dress of dirndl and lederhosen. Every Friday and Saturday there’ll be music entertainment to create a lively, buzzing atmosphere, and German Bundesliga will be shown regularly on big screens for football fans. In October, the Bavarian Beerhouse will host Oktoberfest, the world’s biggest beer festival, in Bristol. Since 2004, the Bavarian Beerhouse’s live music Oktoberfest parties have been recognised as the UK’s number one Oktoberfest event, serving thousands of beer lovers and even the British Army. Owners and husband-and-wife team Rene and Sabine von Reth chose Bristol as the location for their third restaurant after participating in the German Beer Fest in 2012. They immediately felt it was a great place for a Bavarian Beerhouse and set about looking for a suitable venue.